The Motion Picture Association of America (MPAA) produces an annual report to examine the state of the film and television market. The scope was expanded last year to include the Theatrical Home Entertainment Market Environment (THEME). Their 2018 study shows some interesting trends. Most notable is the fact that revenue from home entertainment products - classified in this case as content purchased as a disc (sales and rentals) or digitally (electronic sell through, video-on-demand or via subscription streaming) - climbed 16% above 2017 figures to reach a pinnacle of 58% of the market leaving the cinema experience in 2018 to account for the remaining 42%. This 2018 period saw home entertainment account for revenue of $55.7 billion worldwide while theatrical revenue remained relatively static at $41 billion. And this could be the start of a widening chasm between home entertainment segment as it continues to grow in the face of zero movement from theatrical revenue, which has been on the back foot since at least 2014. The MPAA are not sounding any alarm bells just yet though. Taken together, the overall market is seeing growth. 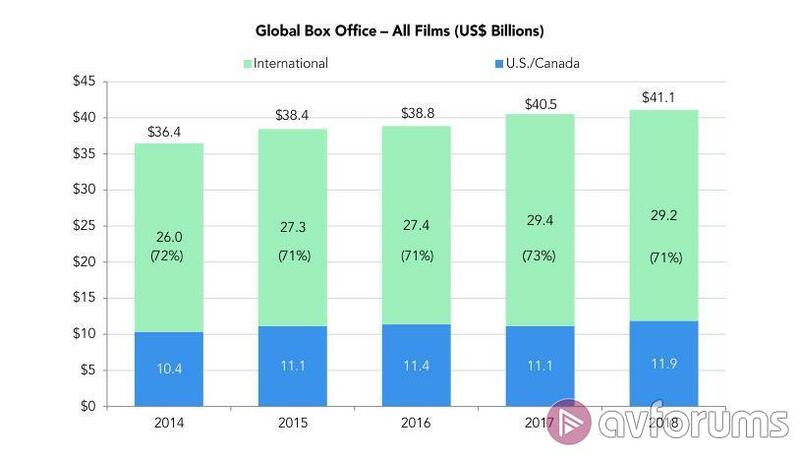 Box office revenues continue to grow across the globe with the U.S/Canada box office reaching a new height of $11.9 billion (up 5% from 2017) and the number of cinema screens around the world increased by 7% to nearly 190,000. Outside the North American market, seven other territories saw revenue climb to over $1 billion in theatres. So even though cinema revenue has atrophied, growth is being driven by people watching at home. One reason for this may be that the traditional theatrical window is shrinking to such an extent that people are prepared to wait a few months to see a movie. With such a huge array of content, movie and TV fans are never up do date with their ‘to watch list’ so they’ve got plenty to keep them going until the latest blockbuster hits rental services or their subscription service, shortly thereafter. Few would deny the impact a huge screen and sound system can have on the enjoyment of a film and the fact that you have had to put aside the time and make arrangements to go out curiously enhances the whole ‘special occasion’ feel and adds value to the experience. However, that actual experience may also include traffic jams, seating fubars, noisy munchers, expensive tickets and an ill-advised curry run amok, which can kill the vibe stone dead. Compare that to the slightly less majestic home viewing scenario where toilet breaks and cups of tea are a natural part of proceedings, and it’s possible to see where the MPAA might feel they have some work to do. Cinema is upping the ante on the experience with new high end complexes being built to provide the very best movie experience (Leeds sees the UK’s second Dolby Cinema open this month) but this is only for a few who are prepared to make the journey and pay for tickets. 3D remains a draw at the box office, accounting for 16% of the total $41 billion theatrical haul in 2018. Clearly, home entertainment’s failed attempt to replicate this experience is one area where cinema can provide something over and above the home version. 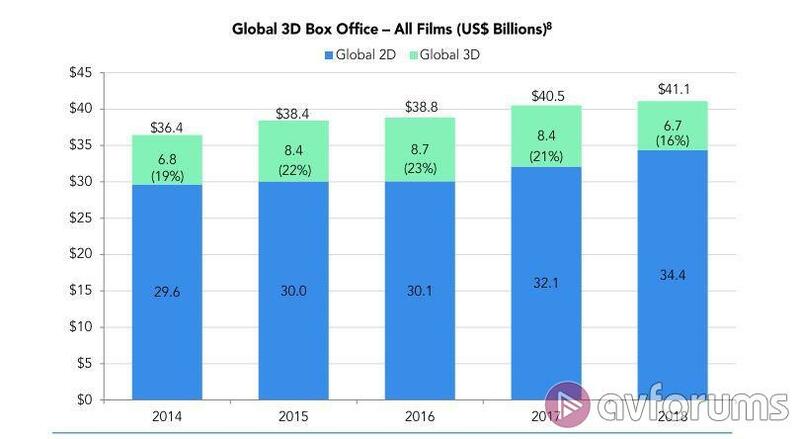 However, 3D at the box office is still struggling compared to a few years ago and revenue in this area continues to drop by a few percentage points annually. 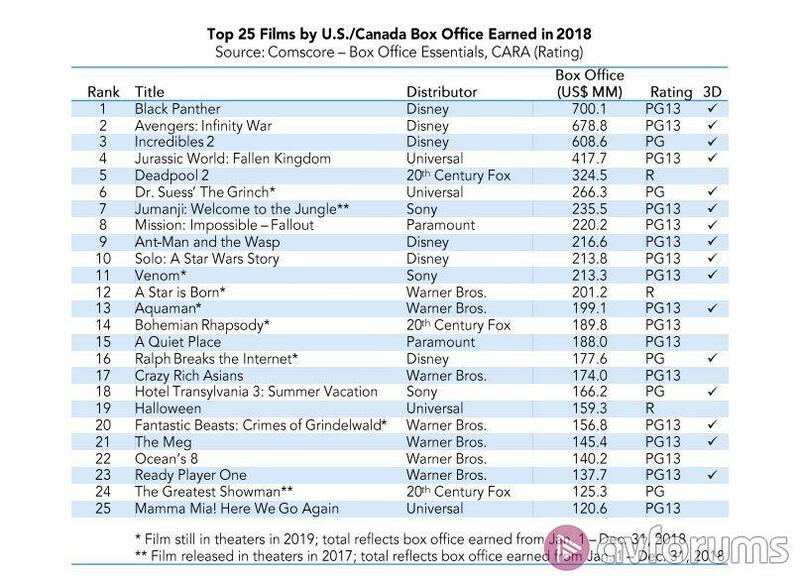 According to the report, three quarters of the US/Canadian population went to the cinema at least once in 2018, and all age groups, apart from the 25-39 year olds and the over 60s, increased their attendance, which is encouraging. However, even the highest attendees (12-17 and 18-24 year olds) only went to see 5.1 films annually. This seems to indicate that cinema going is very much an event-movie driven experience and also of note is the fact that PG-13 films accounted for 17 of the top 25 films in 2018 - only Deadpool seems to be able to break out of these family friendly shackles! What the MPAA might be concerned about is the reliance on frequent moviegoers who amass at least 12 visits per year. Mainly in the younger demographics, this group makes up just 12% of the population but accounts for 49% of the revenue. Note, these figures relate to the US/Canada market, and figures for frequent moviegoers in other cinema markets were not presented. Streaming services are on the increase with some recent new players (Apple) and established companies like Netflix now funding movies/projects to the tune of billions of dollars and, occasionally, to critical acclaim. Interestingly, Roma, funded by Netflix had a limited theatrical run, albeit specifically for awards purposes, but it does show the street going two ways and demonstrates what most movie lovers will think - that both home and theatrical experiences have their time and place. In 2018, there were 613 million subscriptions to online video services, up 27% from the previous year, and this is the first time online service subscriptions have surpassed those for cable TV, though cable remains the highest revenue platform globally with $118 billion in 2018. The upcoming explosion of new online providers such as Apple and Disney will push these subscription numbers ever higher and that could challenge cable and traditional TV services. Despite developments in recent years, MPAA stresses that theatres remain vital to the success of the entertainment industry. In the US during 2018, movie theatres drew more than double the audiences for theme parks and sporting events combined.